Minford native and Rio Grande standout Dylan Shockley was named a Second-Team NAIA All-American standout. Shockley won the River States Conference’s Player of the Year honors back in May. KANSAS CITY, Mo. 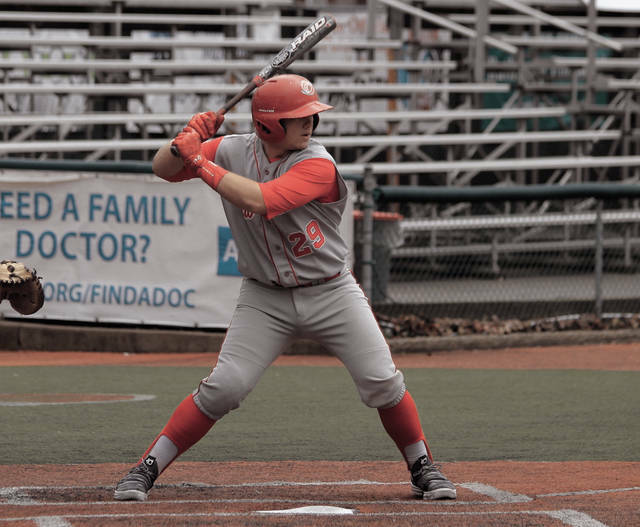 — University of Rio Grande sophomore catcher Dylan Shockley has has been named to the 2018 National Association of Intercollegiate Athletics (NAIA) Baseball All-America Second Team. The team, which was selected by the NAIA-Baseball Coaches’ Association All-America Committee, was announced Tuesday. A native of Minford, Ohio, Shockley hit a team-high .381 with 19 doubles, two triples, four home runs and 38 runs batted in for the RedStorm, who finished the season at 26-26. The only other player from a River States Conference school to be honored was Indiana Kokomo pitcher Renton Poole, who made the honorable mention list. Kiki Menendez of Texas Wesleyan and Jonathan Bermudez of Southeastern (Fla.) were named the National Player of the Year and National Pitcher of the Year, respectively. Menendez, who was also named the Sooner Athletic Conference Player of the Year, had one of the most prolific offensive seasons in Texas Wesleyan history in 2018. The Austin, Texas, native led the NAIA with 26 home runs, while also ranking among the top three in batting average (.466) and slugging percentage (.995) â€“ all three are single-season program records. Menendez ranked first in the NAIA in total bases (190), while owning the No. 2 spot nationally in RBI (84). Bermudez (15-2) won an NAIA-best 15 games to lead Southeastern to the club’s first-ever NAIA Baseball World Series title. The junior also ranked among the top five nationally in innings pitched (110.2) and opponent batting average (.178). Bermudez threw six-or-more innings in 13-of-16 starts, including two complete games. He ended the season with 153 strikeouts.